The 5th Ky. Cavalry was actively engaged on military duty several months before it was regularly mustered into service. Col. David R. Haggard resided, in 1861, in the same general section of the state as Cols. Wolford, Ward, and Hobson. This was peculiarly on the border and separated from the protection which the state had in closer proximity to the Louisville & Nashville Railroad, along which the great armies moved. The organized Confederate forces in Tennessee were in a threatening attitude toward all Southeastern Kentucky in the summer of 1861, and the Cumberland River section was especially exposed. This condition led to the organization of the Unionists as a measure of self-protection. Col. Haggard early began the formation of a regiment. In a communication from Gen. Sherman to Gen. Thomas, of date October 31, 1861, he says; "Col. Haggard is at Columbia with a regiment." November 12th: "Col. Haggard resuming his camp at Burkesville, November 14th." Gen. Sherman says: "Cols. Grider and Haggard are at Columbia, and are acquainted with all the country as far as Bowling Green." All through December and January, 1861, Col. Haggard's cavalry was scouting the country south of Columbia. In February, after the Confederates fell back from Bowling Green, the 5th Cavalry went to Gallatin, Tenn. It was there mustered into the United States service at Camp Sandige March 31, 1862. It then numbered 943, and its subsequent career proved it to be one of the most valuable regiments in the service. The names of the officers by whom it was led are very striking. Col. Haggard had been for years a prominent man in his part of the state and a state official. Col. Wm. P. Sanders, soon made a brigadier general, was a brilliant officer, educated at West Point. He was killed at Knoxville, November, 1863, and the celebrated fort there was named in his honor. There were no more gallant officers than Cols. Haggard, Sanders, Baldwin and Hoblitzell, and Majs. Owsley, Cheek, Glore, and Wharton; Capts. Fleming, Faris, John W. Forrester, Charles Gill; Surgs. Wm. Forrester and Hugh Mulholland were faithful and excellent officers. May 14, 1862, Gen. Negley, at Rogersville, Ala, reports a battalion of the 5th, under Maj. Owsley, making a forced march from Pulaski against the enemy on the Lamb's Ferry Road, where a lively fight occurred, and endurance and soldierly conduct by Maj. Owsley and his men is especially mentioned. In June the regiment, under Col. Haggard, with other troops, crossed the Cumberland Mountain and reconnoitered toward Chattanooga. July 7th it was at Columbia, and on the 8th between Duck River and Wartrace; July 14th at Tantalon. August 11th the 5th, with other regiments under Gen. Richard W. Johnson, left McMinnville, Tenn., and engaged Morgan's Command at Gallatin, but were defeated. Gen. Johnson especially commends the conduct of Capt. Carter and Lieuts. Campbell and Cheek in this fight. Maj. Winfrey was taken prisoner. September 1862, Col. John Kennett took command of the 1st and 2d Cavalry brigades, the 5th being in the 2d. Maj. Owsley then commanded the regiment. The 5th participated in the march of Buell's Army in pursuit of Bragg, and is reported as being at Louisville in September. On the 14th of November, 1862, Col. Kennett reports the 5th as detached from him and on duty at Nashville. It was at Nashville in December, and on December 17th two companies were sent to Brentwood. 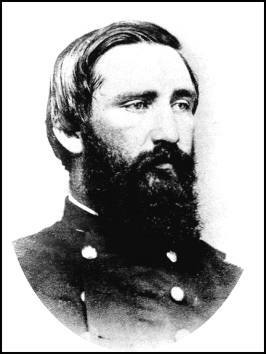 December 19th and in January, 1863, the 5th was in Mitchell's Division, under Maj. Owsley. It remained on duty at Nashville until the spring of 1863. In the organization of the Army of the Cumberland, June 30, 1863, the 5th Mitchell's Division, Gen. Ed McCook's brigade, and command of Lieut. Col. Hoblitzell. In June and July, 1863, the 5th was engaged in very severe service in Middle Tennessee. July 3d the brigade, in which were the 3d Ky. Cavalry, 5th Ky. Cavalry and 6th Ky Cavalry, was led by Col. Watkins, of the 6th. Gen. Sheridan's report of this campaign says the troops moved from Murfreesboro toward Shelbyville, fought at Christiana, camped at Millersburg, then moved to Winchester. There, hearing that Confederate Gen. Wharton was seven miles away, he ordered Watkins to move against him with the 5th and 6th Ky. Cavalry. He says: "This reconnoissance was handsomely executed by Col. Watkins, who drove the enemy about three miles, inflicting a severe loss." Col. Watkins says, in his report of the movements of the 5th and 6th Cavalry under his command, June 23d, marched from Franklin to Triune; June 25th, marched to Murfreesboro; June 28th, from Murfreesboro back to Christiana; 29th, within 5 miles of Shelbyville; 30th, at Shelbyville, and made a reconnoissance on the road to Tullahoma; July 2d, to Tullahoma; July 3d, to Cowan and reported to Gen. Sheridan; July 4th, made a reconnoissance toward University, met the enemy and engaged in a sharp fight; 5th, camped at Cowan; 7th, reported to Gen. Mitchell. At that time the 5th Cavalry, under Hoblitzell, made an expedition to the mountains and returned. Horses reported worn down. In the organization of Rosecrans' army, August 31, 1863, the 5th was in Watkins Brigade, in Stanley's Division. The brigade consisted of the 4th, 5th, 6th and 7th Ky Cavalry Regiments. When the battle of Chickamauga took place, September 19th and 20th, the cavalry corps was under Gen. Mitchell and the 5th was still in Watkins brigade, of Gen Ed McCook's Division. It fought in the battle of Chickamauga, at Crawfish Springs, and was very much cut up. On September 23d it was at Williams' house, 12 miles above Kelly's Ferry, under Col. Hoblitzell; September 27, between Williams' Island and Jasper, October 4th, Gen. Tillson reports the 5th going toward McMinnville, with other troops, in pursuit of Wheeler. December 20th, 1863, the 5th went with a cavalry force under Gen. W. S. Smith on an expedition against Gen. Forrest across the Tennessee River. In Gen. Smith's report, he says he ordered the 5th to move from Columbia to the mouth of the Duck river, clearing the country, and to watch the river from the mouth of Duck to Savannah; at Savannah it crossed the Tennessee and marched to Corinth, which was reached January 8, 1864; thence to Colliersville, which was reached February 8th; crossed the Tallahatchie and moved toward Pontotoc and Houston; thence to Okolona; fought at Prairie Station. The expedition returned to Memphis, having destroyed a great amount of army supplies and railroads and bridges. The reports say the 5th Cavalry acted with coolness, courage and discipline not excelled by any other troops. On the return it was especially efficient, resisting the attacks of a strong pursuing force. Maj. Cheek, who commanded the regiment, was recommended for promotion. August 26, the 5th, with other cavalry, moved from Sandtown, on the road to Fair Oaks; struck the West Point and Atlanta railroad the 28th. There a portion of the regiment under Maj. Cheek sustained a very severe attack. On the 30th advanced on the Jonesboro road to Flint river; near this river the cavalry, including the 5th, engaged in a battle, which, the report of Col. Baldwin says, was the "most brilliant cavalry fight in the South." September 8th the 5th encamped on the Rough and Ready road. Col. Baldwin especially compliments Maj. Cheek and Capt. Glore, the battalion commanders of his regiment; also Lieut. Griffin. The Atlanta campaign being over, the 5th moved with Sherman's army northward, through Northern Georgia, during the month of October, 1864. Then it was chosen to accompany Sherman's cavalry in the march to the sea (See 3d Ky. Cavalry, Murray's Report.) It shared all the dangers of that campaign in the cavalry command under Gen. Kilpatrick. After leaving Savannah it marched through the Carolinas, having many encounters. At Monroe's Crossroads, February 8, 1865, Adjt. Mitchell was killed in an engagement. 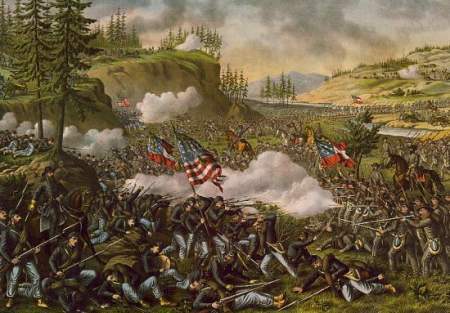 It was also engaged in the battle of Bentonville. The end of the war being at hand, and the term of service of the 5th having expired, it was ordered to Louisville, Ky., where it was mustered out of service May 3, 1865. The men who re-enlisted as veterans were transferred to the 3d Ky. Cavalry. The foregoing is an inadequate account of this splendid and faithful regiment, but enough is given to show the long, hard service it performed and its great value in the tremendous task of preventing the dismemberment of our national Union. Organized at Columbus, Ky., December, 1861, to February, 1862, and mustered in at Gallatin, Tenn., March 31, 1862. Served with Unattached Cavalry, Army Ohio, to September, 1862. 2nd Brigade, Cavalry Division, Army Ohio, to November, 1862. 4th Division, Center 14th Army Corps, Army of the Cumberland, to January, 1863. 2nd Brigade, 1st Division, Cavalry Corps, Army of the Cumberland, to July, 1863. (District Central Kentucky, Dept. of the Ohio, April to June, 1863; 2nd Brigade, 4th Division, 23rd Army Corps, to July, 1863; 4 Cos.) 3rd Brigade, 1st Division, Cavalry Corps, Army of the Cumberland, to January, 1864. 3rd Brigade, 1st Cavalry Division, 16th Army Corps, Army Tennessee, to April, 1864. 3rd Brigade, 3rd Division, Cavalry Corps, Army of the Cumberland, to October, 1864. 3rd Brigade, 3rd Division, Cavalry Corps, Military Division Mississippi, to November, 1864. 1st Brigade, 3rd Division, Cavalry Corps, Military Division Mississippi, to January, 1865. 3rd Brigade, 3rd Division, Cavalry Corps, Military Division Mississippi, to May, 1865. SERVICE.--Duty at and near Columbia scouting and operating against guerrillas on border until February, 1862. Gradysville, Ky., December 12, 1861. Moved to Gallatin, Tenn., February, 1862, and duty there and in Tennessee until September. Lebanon, Tenn., May 5. Lamb's Ferry May 10. Expedition to Rodgersville, Ala., 13-14. Lamb's Ferry May 14. Sweeden's Cove June 4. Chattanooga June 7. Raid on Louisville & Nashville Railroad August 12-21 (Detachment). Hartsville Road near Gallatin August 21 (Detachment). March to Louisville, Ky., in pursuit of Bragg, August 22-September 26. Glasgow, Ky., September 18. Pursuit of Bragg into Kentucky October 1-22. Burksville November 8. Kimbrough's Mills, Mill Creek, December 6. Operations against Cluke's forces in Central Kentucky February 18-March 5, 1863. Duty at Franklin and in Middle Tennessee until June. Near Nashville May 4. University Depot and Cowan July 4. Expedition to Huntsville July 13-22. Expedition to Athens, Ala., August 2-8, Passage of Cumberland Mountains and Tennessee River and Chickamauga (Ga.) Campaign August 16-September 22. Reconnaissance from Alpine to Summerville and skirmish September 10. Battle of Chickamauga September 19-21. Operations against Wheeler and Roddy September 30-October 17. Smith's Expedition from Nashville to Corinth, Miss., December 28, 1863, to January 8, 1864. Smith's Expedition to Okolona, Miss., February 11-26. Okolona, Ivey's Hill, February 22. New Albany February 23. Atlanta (Ga.) Campaign May to September. Scout from Alpine to Summerville May, --. Near Nickajack Gap May 7. Near Resaca May 13. Battle of Resaca May 14-15. Adairsville May 17. Operations on line of Pumpkin Vine Creek and battles about Dallas, New Hope Church and Allatoona Hills May 25-June 4. Operations about Marietta and against Kenesaw Mountain June 10-July 2. On line of the Nickajack July 2-5. On line of the Chattahoochie July 5-17. Summerville July 7. Sandtown and Fairburn August 15. Siege of Atlanta July 22-August 25. Kilpatrick's Raid around Atlanta July 18-22. Lovejoy Station August 20. Flank movement on Jonesboro August 25-30. Flint River Station August 30. Battle of Jonesboro August 31-September 1. Lovejoy Station September 2-6. Operations against Hood in North Georgia and North Alabama September 29-November 3. Camp Creek September 30. Sweetwater and Noyes Creek near Powder Springs October 1-3. Van Wert October 9-10. March to the sea November 15-December 10. Jonesboro November 15. Towallaga Bridge November 16. East Macon November 20. Griswoldsville November 22. Sylvan Grove and near Waynesboro November 27. Waynesboro November 27-28. Near Waynesboro November 28. Near Louisville November 30. Millen Grove and Louisville December 1. Rocky Creek Church December 2. Waynesboro December 4. Siege of Savanhah December 10-21. Campaign of the Carolinas January to April, 1865. Blackville, S.C., February 7. Near White Post February 8. Williston February 8. Johnson's Station, February 11. About Columbia February 15-17. Lancaster February 27. Phillips' Cross Roads, N. C., March 4. Rockingham March 7. Monroe's Cross Roads March 10. Averysboro, Taylor's Hole Creek, March 16. Battle of Bentonville March 19-21. Occupation of Goldsboro March 24. Advance on Raleigh April 8-13. Morrisville and occupation of Raleigh April 13. Chapel Hill April 15. Bennett's House April 26. Surrender of Johnston and his army. Mustered out May 3, 1865. Regiment lost during service 4 Officers and 32 Enlisted men killed and mortally wounded and 5 Officers and 172 Enlisted men by disease. Total 213. Riding With Sherman: The Civil War Travels of the Fifth Kentucky Cavalry, USA, by John S. Palmore, former Chief Justice of the Supreme Court of Kentucky. Copyright 2000. Published by John Palmore, Frankfort, Ky.